Today's post is going to be short and sweet, but Parker and I really loved the message from church this past weekend and wanted to share it with you all. My favorite Christmas decoration each year is the Christmas tree. I love to decorate it and pull out all of the ornaments I had forgotten about from the previous year. I love to put presents under the tree. I love to turn the lights on and see how beautiful it all looks put together. Historically speaking, the Christmas tree originated centuries ago in Germany. Boniface cut down an oak tree that the German pagans worshipped and replaced it with an evergreen tree, telling them how its triangular shape reminds humanity of the Trinity and how it points to Heaven. Here's an analogy: The Christmas tree symbolizes Jesus Christ, green year round even during the darkest winters. We are the lights that adorn the tree. The lights make the tree noticed by shining brightly all around. We are those lights that should be shining brightly for Him. 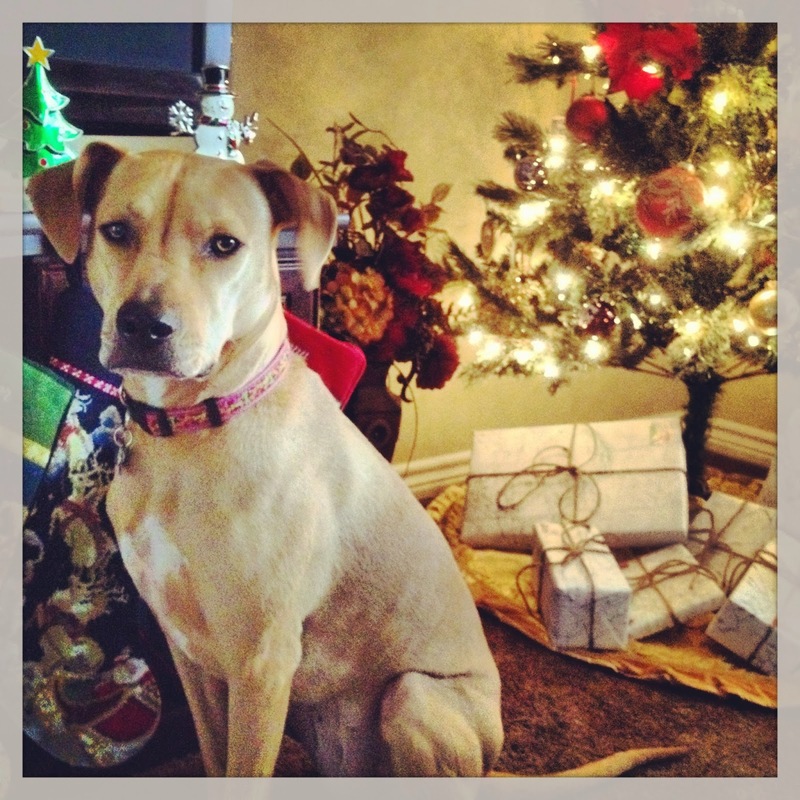 This is a picture from last year, but I love how brightly the lights are shining on our tree behind the Jen pup. As Christians, it is our job to show people Christ. We all have unique gifts that allow us to shine and glorify God through those gifts. This Christmas, let your light shine. When someone cuts you off on the freeway, wave to them (with your hand, not your finger). Hold the door for strangers when you're leaving the store. Let someone have your seat on the bus. You get the idea. Just be a light. This Christmas, I feel so blessed. It's almost surprising to me because of what we have gone through in the last month with losing Taylor Grace, but we have been given so many blessings this year, and we are so undeserving. This Christmas and every day, just spread the joy. A simple act of kindness can go a long way. We are here to shine, so go out there and do it. Thanks for sharing. I love to decorate the tree too. Have a Merry Christmas. I love this post -- what a great message and way to be, essentially, a better and more forgiving person. I love that Christmas tree analogy! Beautiful post! And as an aside, I laughed out loud at the "with your hand, not your finger" comment!